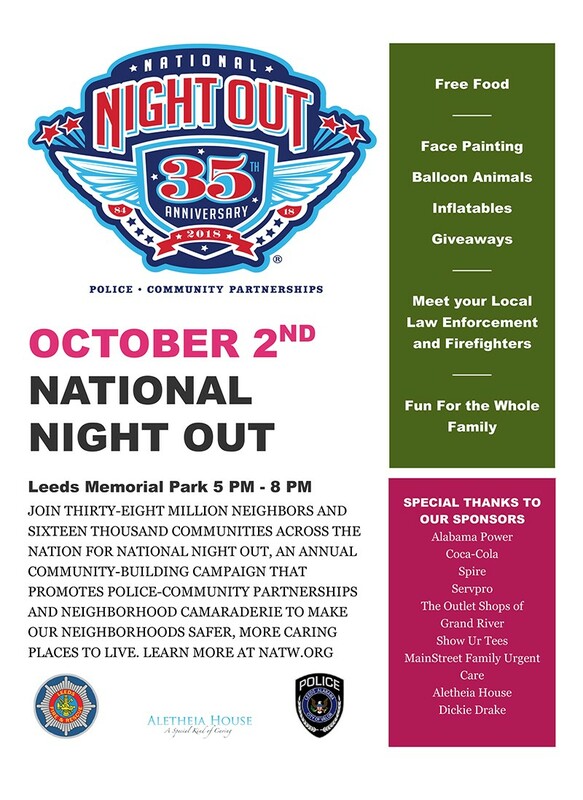 Join Leeds Police Department for National Night Out 2018 from 5:00 p.m. until 8:00 p.m. on Tuesday, October 2, 2018 at Leeds Memorial Park. Join thirty-eight million neighbors and sixteen thousand communities across the nation for National Night Out, an annual community-building campaign that promotes police-community partnerships and neighborhood camaraderie to make our neighborhoods safer, more caring places to live. This special event will include: Free food, face painting, balloon animals, inflatables & giveaways. Meet your local law enforcement and firefighters with fun for the whole family! Learn more about National Night Out at www.natw.org.